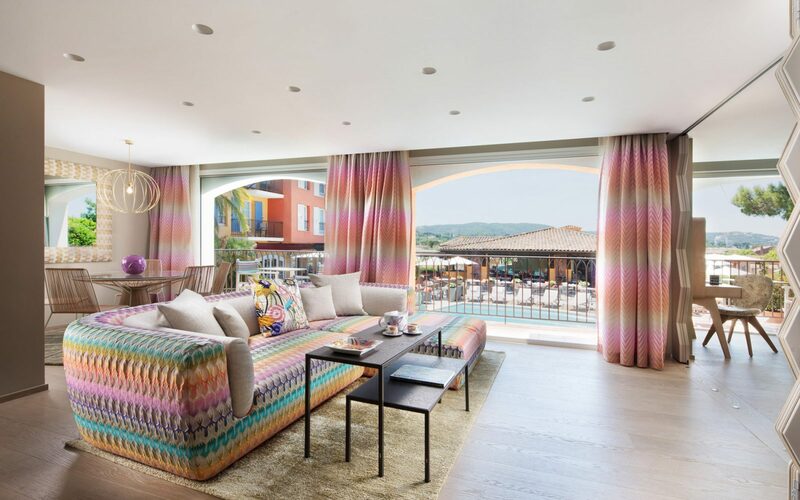 The biggest & the most beautiful suite at The Byblos Hôtel in Saint-Tropez is the perfect combination of Italian aesthetics and French joie de vivre, as Marijana Milenković defined this fabulous redesign signed by Missoni Home, for August issue of Elle Serbia. 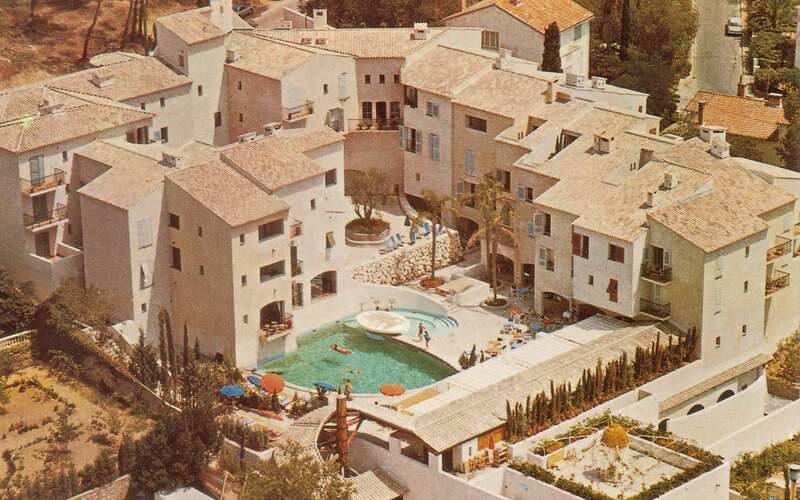 Exactly 50 years ago, a glamorous celebration that lasted three days and three nights open The Byblos Hôtel. 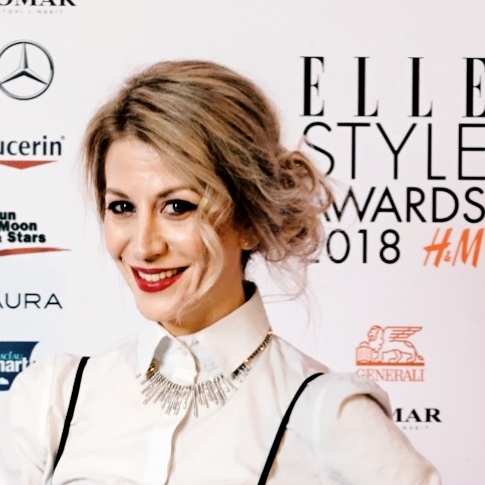 700 selected guests from all over t he world, the cultural, political and artistic elite in May 1967, for the first time in a series of ceremonies, felt the unique concept of a hotel that, from the very beginning defied trends. A magical place with a unique atmosphere of “Thousand and One Nights” in which they enjoyed diva Brigitte Bardot, rock legend Mick Jagger and the unrepeatable Jack Nicholson, combines the incompatible: relaxation and fun, elegance west and the pleasure of the east the exposure in the privacy of the beautiful and calm ambience in the heart of Saint Tropez. 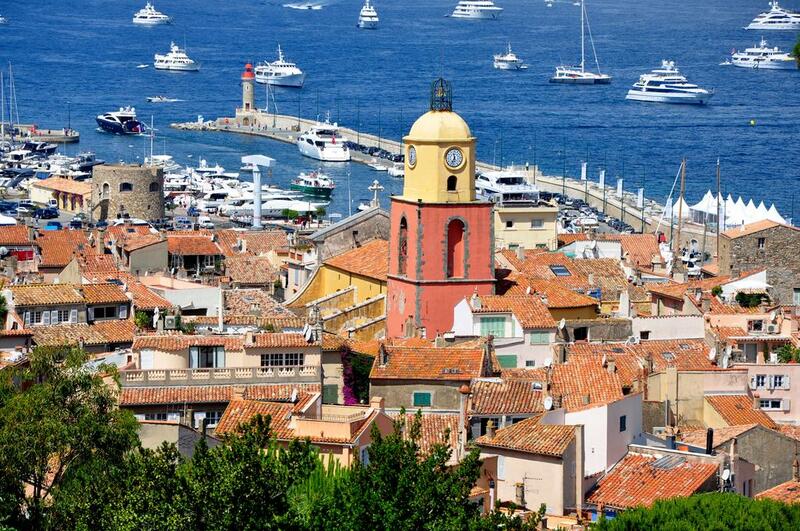 A summer in the south of France and a little fishing village that seduces a sweet lifestyle. 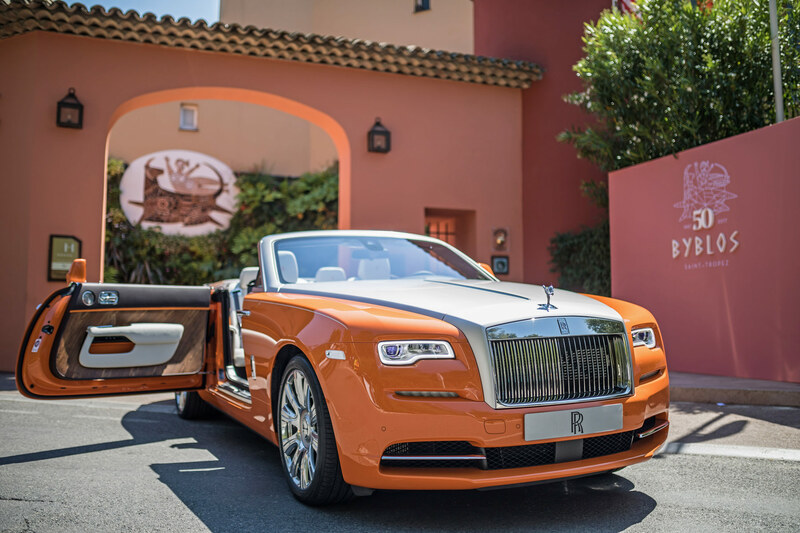 The scent of the sea and the charming architecture of Mediterranean traditions mixed with glittering luxury, grandiose yachts, fast cars and the best restaurants. 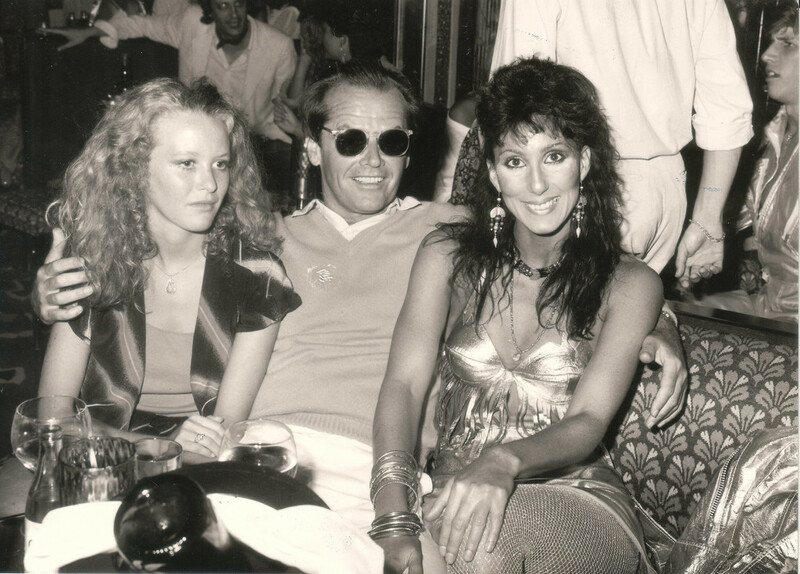 The Byblos Hôtel is one of the most famous hotels in Saint Tropez and for fifty years a symbol of timeless Mediterranean enjoyment with a sense of Hollywood glamour. 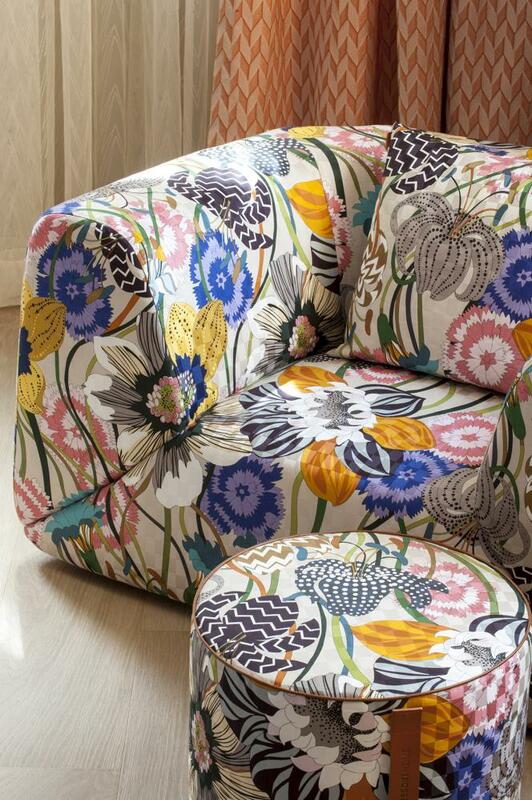 This not just an exercise in style. We wanted to combine the best of all worlds to create an extraordinary new universe. Here are the fruits of our labours. This year everything is in the mark of the fiftieth anniversary of the opening of the hotel. 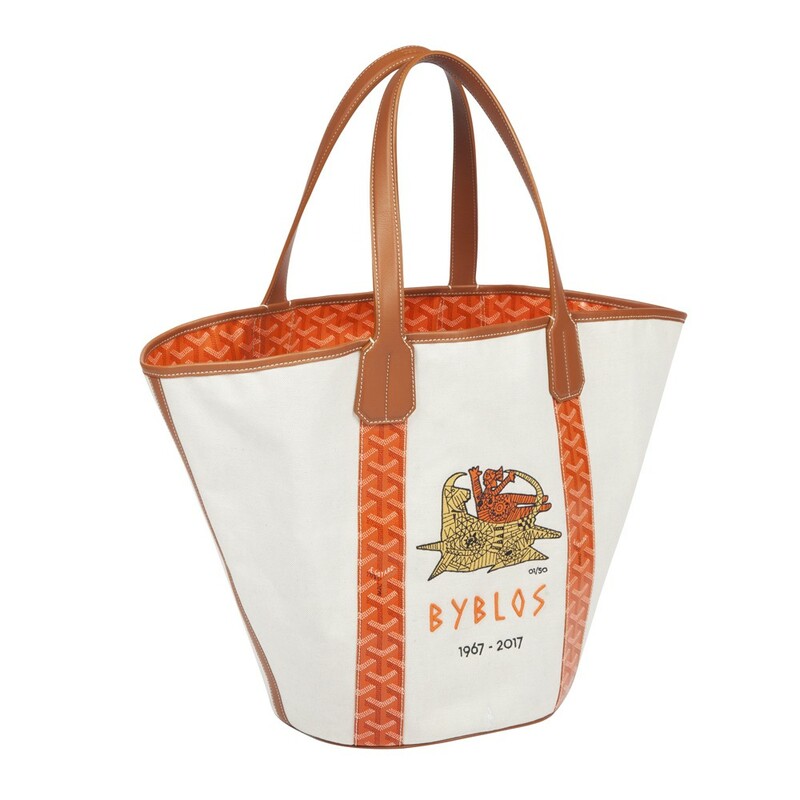 On the occasion of the great jubilee, the luxurious partners of The Byblos Hotel have created special gifts. 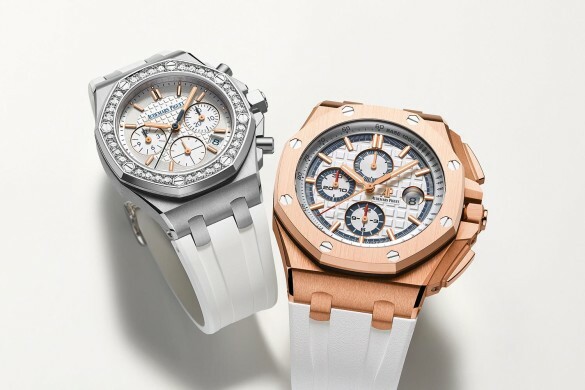 Audemars Piguet has designed a limited edition of watches for him and her; Rolls Royce has introduced a new model in a vibrating color that accompanies the logo of the hotel; brand Goyard designed a luxury bag inspired by the spirit of the hotel. 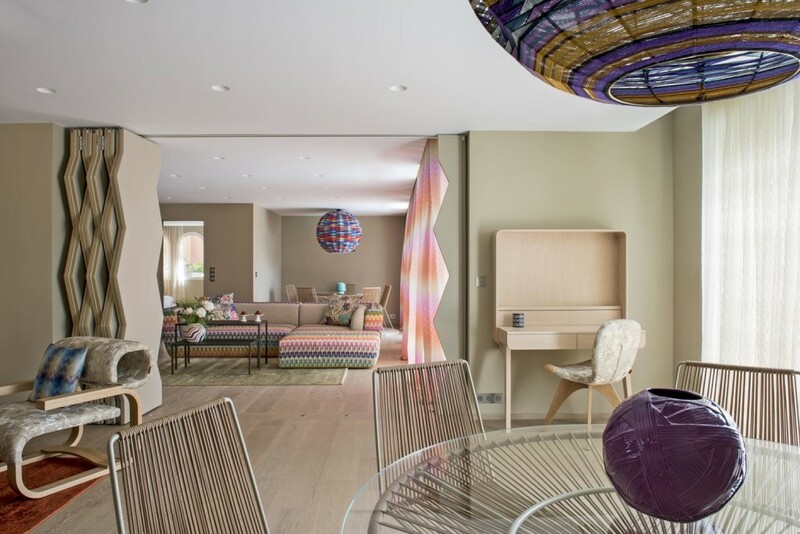 However, the biggest surprise is a grandiose project of redesigning the largest suites signed by fantastic Missoni Home. Distinctive colors, striking forms of furniture, discrete details in an emotional game of contemporary tradition in a special way transform the space of the largest and most luxurious apartments of The Byblos Hôtel in a perfect blend of IItalian aesthetics and French joie de vivre! 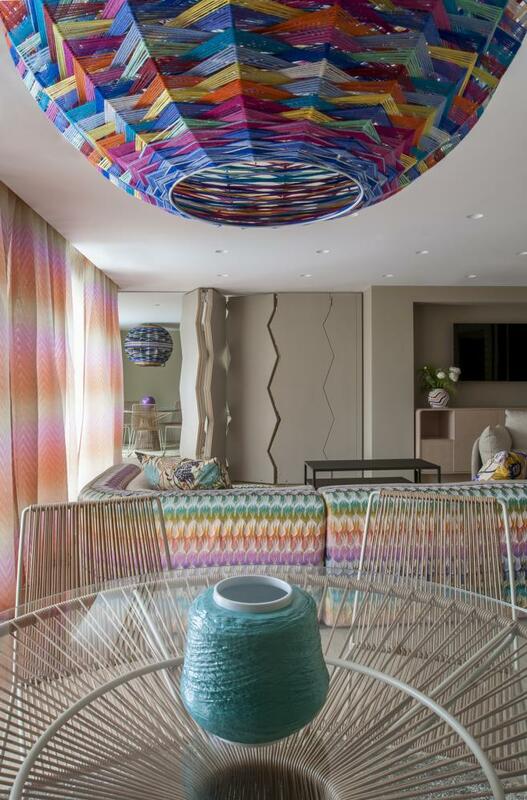 Inspired by the dream-up color of the sea that flows into the perfect blue of the sky of the French Riviera, Rosita Missoni with her team has designed a beautiful ambience of 180 m2 large suite in the very heart of the hotel. 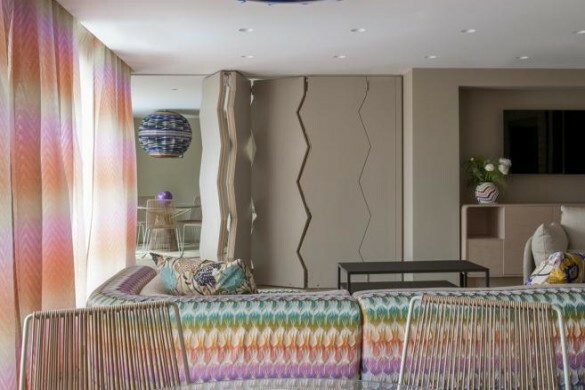 The entire area of the apartment is designed as unique space that can be turned into two separate units with a movable zig-zag pattern screen, exclusively conceived and designed for this project by Rosita Missoni’s team. The sand-colored walls discreetly frame the entire space that consists of two subtly different ambiences: one is dressed in warm tones with the addition of a pastel pink with a sunny yellow glare, while in the second ambience dominated by vibrant colors that flow from royal blue through natural green to orange. 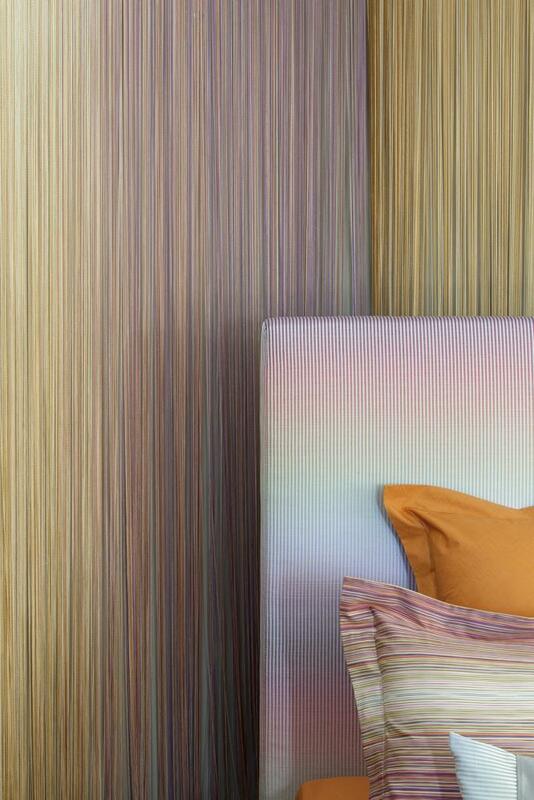 Sophisticated palette of bright tones gradient through the entire space in a perfect arranged stars of Missoni Home collection. Sofas”Inntil“ combined two materials with a slightly retro lines of “Daniela“ armcahirs completes the composition of living areas, while the vibrant dining room design from collection “Cordula“ complete with a lively “TheaKuta“ chandelier. Each room has one bedroom with a bathroom that is stylishly integrated and designed as a oasis for relaxation. 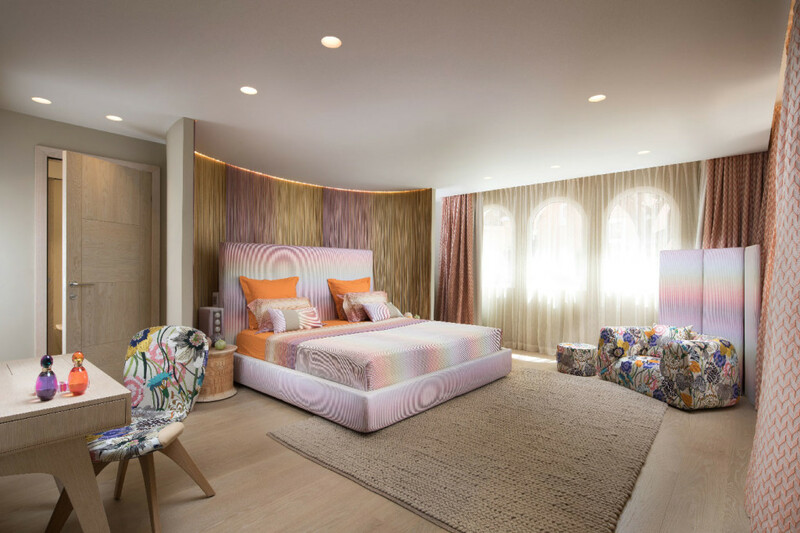 The most beautiful moment in the design of a spacious bedroom that belongs to the sunny ambient is a curved wall dressed in spilled stripes of pastel ocher and lavender colors, which makes the perfect paspartu for cloud-like king-size bed with high headboard. 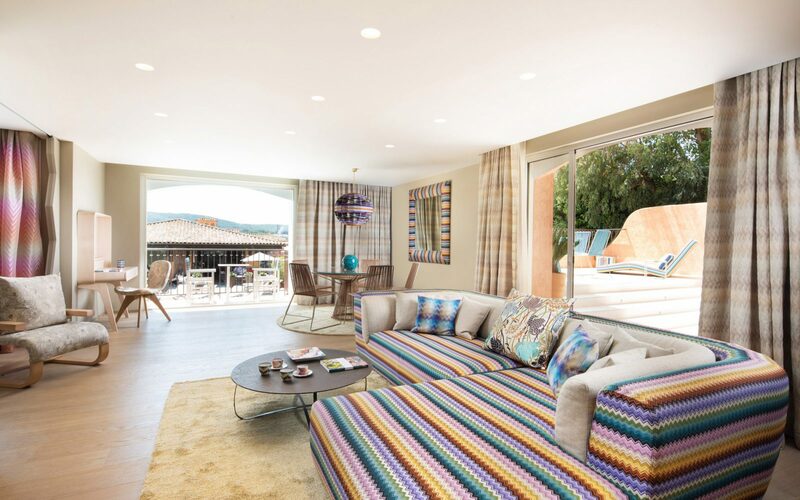 The second bedroom is smaller, but the surprise is hidden behind turquoise draper – spacious terrace! 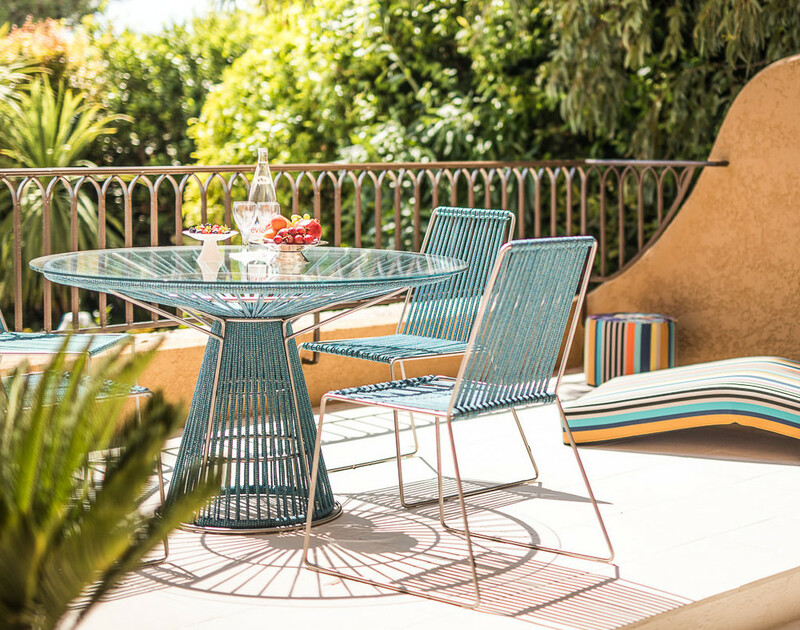 The design under the clear sky and the perfect simplicity of the Jalamar lounge chair shape is emphasized by the contrast of linen pattern and full color. Several stairs steps along a powdery white stone staircase lead to the second part of the terrace with a beautiful view of the pool and turquoise Cordula Outdoor table and chairs. 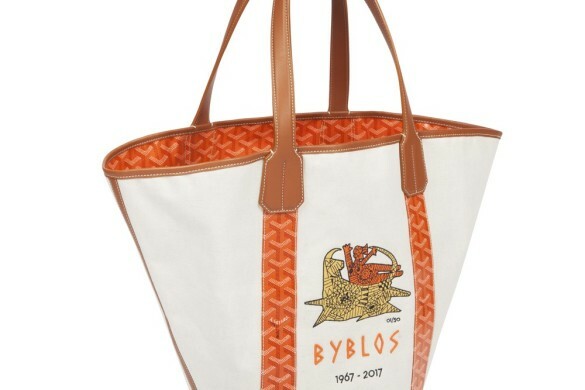 A contemporary designed atmosphere painted by the most beautiful emotions the designer has drawn into the space through the harmony of colors that brings with it the joy of family gatherings and a sophisticated aesthetics that is a common tradition for both Missoni and Chevanne family that continues the long tradition of The Byblos Hôtel. 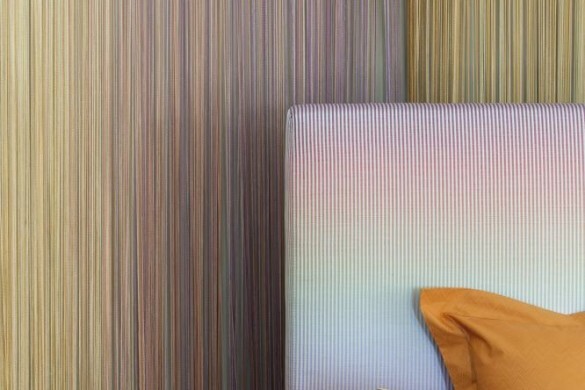 This perfect reinterpretation of the space is stained with emotions that blend with the colors of the Mediterranean and inspired by the family heritage and a completely personal experience of Rosita Missoni, which is similarly related to its brand like The Hotel Byblos for Saint Tropez. 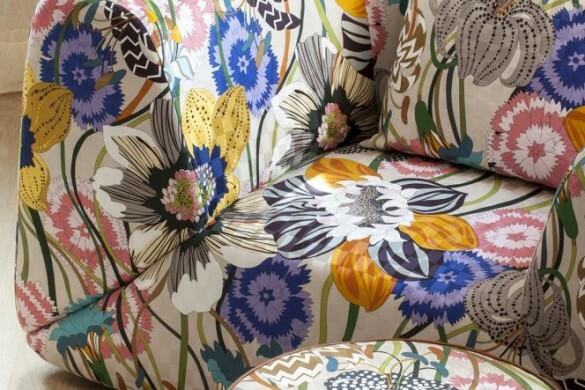 Joie de vivre in the true sense of the word !